Before you begin, I beg you to remember that this is the first and roughest draft of my fledgling memoir. Please read gracefully, knowing that it has not been fully edited. And by all means feel free to offer comments and suggestions. Lastly, I’m still in flux as to the title. I welcome any ideas!! The Truth in Love is a critical component of treatment at Remuda. It’s staged at the halfway point, 30 days into an adolescent’s minimum stay of 60 days. Parents and family members who play a significant roll in a patient’s life are invited to The Ranch for one week. It’s a time for family counseling, large group therapy and a chance for the patient to practice healthy behaviors in their family environment. My family shared a week with three other families. Each family was given one day that week to have their Truth in Love. The rest of us sat in a circle around them, offering emotional support, solidarity and praying to learn something we could apply to our own story. Each patient’s personal therapist directed their family’s conversation. Similar to a twelve step program, we made lists of offenses and amends. Then, according to Ephesians 4:15, we tried to share our feelings truthfully, but gently and in love. Throughout the first month of treatment, Keri and I discussed the family dynamics that had contributed to my eating disorder. Once a week, we had conference calls with my parents, and often my sister, Jennifer was included. As our week approached, Keri suggested that Jennifer join my parents when the came to Arizona. Keri stressed that no one was at fault, it was simply the way we perceived each other, just the way things were. 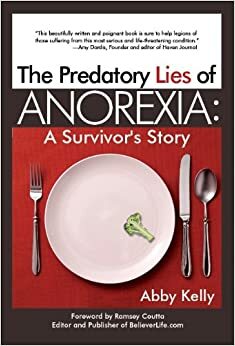 But, at the time, it seemed so easy to play the victim and pin blame on someone for making me act out through anorexia. As I made my lists of offenses and amends to share with Mom, Dad and Jennifer, I faced the impossible question: What caused me to develop an eating disorder? My Truth in Love was scheduled for Tuesday, March 12, the day after my birthday. Dad, Mom and Jennifer flew into Arizona late Sunday night. I hardly slept. What if they were put out having to come here to help me? What if they were exasperated that my brokenness cost them money, time and energy? What if they didn’t want to be here? And worst of all, what if this was wasted, and I couldn’t get this recovery thing right? I was grateful that Monday breakfast was always a bran muffin, cottage cheese, canned peaches, peanut butter and milk. It was a relatively “safe” meal for me, and satisfied my required exchanges of three bread, two meat, two fruit, two fat and one milk. The butterflies in my stomach were able to focus solely on the arrival of my family and not worry about breakfast. Did they remember it was my birthday, my 16th birthday? Or had my family forgotten since for a full month they hadn’t had to be aware of me. Maybe I was a non-issue in the Blades family by now. “Abby, as soon as you’re finished, can you come to the med window, honey?” Evelyn, my favorite nurse waved at me from the edge of the dining room. “Am I in trouble,” I mouthed. She shook her head and disappeared back around the corner. I liked Evelyn because she had mastered the art of being everyone’s mother. She was the supreme comforter when you had to eat all of your fat exchanges in one sitting because you had declined them earlier in the day. She was the one who would rub your back in lazy circles while you cried yourself to sleep. Evelyn was part Hispanic. Neither too heavy nor thin, she always wore light purple scrubs and smelled like lavender. Everything about her was soft, from her deep, black eyes, to her wavy, untamed hair to her large, capable hands. Evelyn daughter named Shani who was also a nurse at Remuda. Shani was still in school and didn’t plan to make Remuda her career as her mother had. But she was as spunky as Evelyn was maternal. Her right ear had eight piercings, including the tragus, which made her all the more daring and edgy to me. Usually, no matter who finished first, everyone at the table waited for the slowest person to suffer through their last bite. Thankfully, Shani was our table monitor that day. With a slight nod, she released me to go find out what Evelyn wanted. The shout came from in front of and behind me. Standing in the same hall where I had first entered Remuda, before the med window where I had first seen Alicia, stood both my parents and my sister. Jenny stood next to Daddy holding a heart shaped mylar balloon that proved they hadn’t forgotten my special day. Daddy reached to hug me next. I broke loose from Dad and threw my arms around my little sister. In those minutes, it seemed impossible that I had ever doubted their love for me. It seemed crazy that I might accuse these wonderful people of making me sick. Of course they loved me! “I heard them say they brought you a gift! We want to see it, too. Open it! Open it!” Alicia bounced lightly in her chair, and for once no one shushed her or accused her of trying to burn extra calories. I took a light blue bag from Mom’s out stretched hands. No one in our family does elaborate gift wrapping, but Mom can do a great curly ribbon bow. I grabbed a butter knife from the table and sawed through the white ribbon. Beneath wads of crushed, voluminous tissue paper, I found a small jewelry box. I lifted the box from its cocoon of paper and pried it open. A huge aquamarine, my birthstone, gleamed from the crease in the box. I heard the truth in Mom’s words. For that day, I believed her. The lie would resurface; it was one of my grievances or offenses listed for the Truth in Love tomorrow.